This year’s Easter Tournament was shot under perfectly blue skies with lots of happy archers competing for the chocolatey trophies. 14 of Castle Bowmen’s finest were competing for the glory of the club…. and the chocolate. Our Barebow contingent, as always, did us proud. Sarah I’ winning the Golden egg for her Junior category, Kathy C’, also acting as Lady Paramount for the day, took the Silver for the Lady Barebows with Caz’ P’ taking the Gold along with 2 Welsh records and 3 County records. Castle Bowmen Gent Barebows took all the top spaces in their category with Ian M’ taking 4th spot, Karl C’ picking up the Bronze, Chris O’ took a magnificent Silver and Mike Wo’ took home the Gold along with a Welsh record for the Double WA70m. In their first tournament Daniel H’ won Gold in his Junior Recurve category plus a coveted colour prize, while Mark H’ also took home a deliciously chocolatey colour prize. Wendy W’ won the Lady Recurve Gold prize, with Mike B’ taking a well deserved Silver prize for the Gent Recurves. The Castle Bowmen AGM and Annual handicap improvements awards ceremony was very well attended, the highest turnout ever in fact. With more than enough food to keep everyone happy. The Chairman thanked everyone for helping to make the club the smooth running, fun and safe place it is today, and urged newer archers who might not do tournaments to maybe give them a go to see how fun they are. Castle Bowmen is still one of the biggest clubs in Wales and with future plans for next years 50th Anniversary in full swing it is hoped we will continue to give all our members an enjoyable place to make friends and practice their archery. WEEKDAY OUTDOOR SHOOTING IS HERE !!! Christian L’ (Recurve), Mark H’ (Compound) & Mike Wo’ (Barebow) gain their indoor ‘D’ classifications. The final indoor session of the Winter season is on Sunday 31st March at St Davids. Then it’s outdoors all the way through the summer. The 1st weekday Outdoor Session is next Wednesday (April 3rd) from about 5-30pm til it gets dark. As the end of the winter postal season is looming, with only this month’s matches left to make a difference in the final results, the postal guardian has received notification from the central organisers of our progress so far (well up to and including Januarys matches, we don’t want to spoil the surprise too much). Well done to Chris O’ for being the sole Castle Bowmen representative at Llandaff City Bowmen’s Open Portsmouth tournament … and coming away with an awesome victory. Not only did he win the Gold after coming top and beating everyone in his category, he also recorded a PB (Personal Best score)… AND ... claims the prestigious Red Dragon Badge too. The full chart rundown for the Postals is ready to view. Click the Blue one for the Frostbite League and the Red one for the Portsmouth League. Only one more match to play this season before the winners are decided. Teams are listed, as always, on the Postal League page. For the 13th year in a row Castle Bowmen has had the honour of hosting the Glamorgan County indoor Championships, and as always the tournament was enjoyed by many with the highest turnout in years. Not only did many of Castle Bowmen help superbly in the smooth running of the event but they also shot in it too, with many excellent results. Drew M’, Gerhard N’, Christian L’, Mark H’ and Daniel H’ all were competing in their first official tournament and had some good results. Ian M’ for the Barebows came 3rd in the afternoon session and Steve shot too with no major issues. At the end of the day, after the the entire day’s results were combined there was yet more success for Castle Bowmen’s team of awesome Barebows as they came away with medals of every colour. The two Castle Bowmen barebow teams came 1st AND 2nd amidst a field of many good individual barebow archers. Chris O’ took home the Silver Medal for the Gent Barebow with Andrew P taking the Bronze. Kathy C’ also took the Bronze for the Lady Barebows with Caz’ P’, shooting a PB (personal Best score), AND a Glamorgan Masters County Record to take home the trophy and Gold. Here are a few photos to show how thoughtful and focused our team were on the day. Here are the Postal League charts for the January Portsmouth and Frostbite tournaments - Just click the pictures below to view. At the end of the 10 dozen arrows, cakes and cups of tea the final results held good news. Andrew had taken the Bronze medal for the Gent Barebows and Kathy took home the Gold for the Lady Barebows plus a well deserved Red Dragon achievement award badge. Well done to all the Castle Bowmen archers who shot at the Welsh Indoor Championships held in Cardiff. Mark H’, in his first Indoor tournament, Caroline P’, Kathy C’, Sarah I’, Karl C’ all enjoyed themselves at this important competition in the archery Calendar. 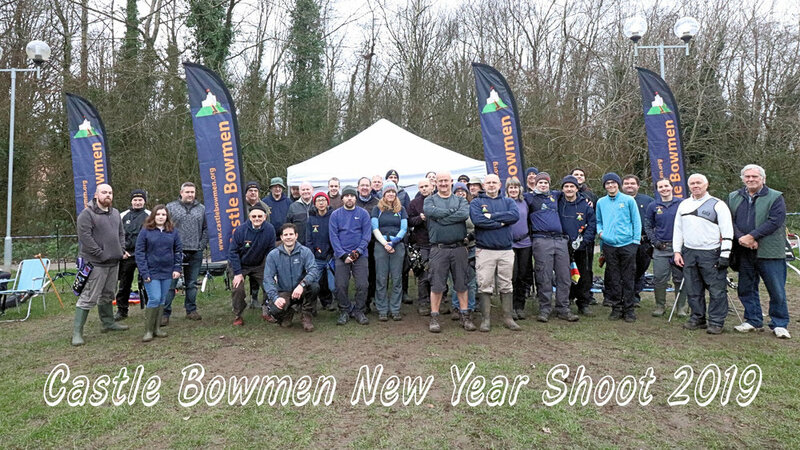 The Castle Bowmen New Year Shoot was well attended this year, 35 of Castle Bowmen’s finest shot in what is officially the first tournament of the 2019 summer season. It was the highest number of archers shooting since 2011 when the shoot was first devised. All prizes and results will be presented at the Club’s Annual dinner (31st January - Book your place now). For a quick review of the Castle Bowmen year click the video link, then for a more detailed analysis of 2018 just keep reading below. As the year is ending we once again have to reflect on how awesome Castle Bowmen is, and most of it is even true. The Club’s numbers have stayed fairly consistent with over 100+ members keeping us one of, if not THE, biggest club in Wales. In 2018 our awesome archers won over 86 tournament medals, 4 County championship titles, numerous County & Welsh records, another 2 Welsh Champion titles, and also won the Barebow Team Medals at the WAA Inter-County Championships. We once again have the top 4 ranked Lady Barebow archers in Wales for the 2nd year running, plus plenty of UK ranking representation too. Every member of Castle Bowmen shot exceptionally well over the year, many attaining new PB’s (Personal Best scores) with 52 archers being awarded new Classification badges. We started a new achievement scheme this year called the ‘252’ scheme. Each archer that shoots to the required score receives a nice new ‘252’ badge for their quivers. So far more than 160 badges have been awarded. Castle Bowmen Juniors had some good success stories this year. Sarah I’, competing in tournaments around the whole country, and winning Gold in many, has attained Junior Master Bowman Classification. Sarah also competed in the British Barebow Indoor Championships in December and placed 2nd in her age category - That’s 2nd in the whole of the UK, so congratulations to her. Rachel T’ won the coveted title of Club Champion after winning the Club New Year H/C Shoot. More than 70 trainee archers have joined our beginner courses over the last year to be coached by our awesome coaches and many have then gone on to become full members. Castle Bowmen's AGM was well attended and lots of important club business was discussed. The new committee, charged with the smooth running of the club, were sworn in and a full review of the year was given by Rick S', the Chairman. Before during and after the official proceedings the members who attended enjoyed a lovely buffet arranged by Steve C'. This was also the official unveiling of the club's new look website. Rick also wished everyone good shooting in the year to come. The Annual award for the archer making an exceptional contribution to the club, the ‘Arthur Knighton’ trophy, was presented to Stuart H’ for his dedication and commitment to all aspects of the club. We started 2018 with our customary cold and muddy New Year Handicap shoot to determine our club champion, which this year was awarded to Rachel T’ from the Castle Bowmen Juniors. From the Easter shoot, the most chocolatey competition in Wales and also a Welsh Ranking event, The ‘Val Goodman’ Junior May Metrics (The Only annual Junior-Only 12 dozen round tournament in Wales) to the Doug Woodley mid summer WA900 shoot, all the visiting archers from other clubs agreeing they had a very enjoyable time. And not forgetting our unique annual Club Team Head-to-Head Tournament in October, with many of Castle Bowmen’s archers competing to win officially the biggest Archery medals in Wales, and the even more sought-after Losers Wooden spoon trophies. Proudly fluttering at all these tournaments were the clubs brand new magnificent Castle Bowmen flags. 2 of our teams won their divisions in the Frostbite and Portsmouth Leagues and received shiny new winners badges. Junior Team's Division:- SarahI' (Nov' & Feb'), LukeY' (Jan') & TomasD' (Feb'). Nine archers from Castle Bowmen:- Caz’ P, Kathy C’, Chris O’ & Andrew P’ (Barebow Team), Alan G’ & Wendy W’ (Longbow Team), Mike Wo’ & Michelle W’ (Recurve Team) and Sarah I’ (Junior Barebow Team) were chosen to be members of the Glamorgan County team for the wettest WAA inter county championships ever, held in East Wales. Andrew, Caz’, Kathy and Chris also received an individual category medal for winning their respective Barebow categories. In the ArcheryGB 2018 UK rankings list Castle Bowmen feature. The December Postal League Frostbite and Portsmouth shoots have been completed and the teams are now on the Postal League page, scores and results will be posted as we receive them from the central UK organisers. The fully updated league chart videos are also available for your viewing pleasure (or dismay), Just click the pictures below - Blue for Frostbite and Red for Portsmouth. These include the highest scores from the league rounds so far. Congratulations to Sarah I’ for coming 2nd in the U18 category at the XVII British Barebow Indoor Championships. Excellent shooting gained her a great score and a shiny Silver medal. Click >here< to see all the scores from this prestigious tournament. The Field captain is responsible for the safe and orderly conduct of shooting. The appointed field captain will be responsible for giving ‘Audible’ signals to indicate archers may proceed to shoot or collect. BEFORE giving the signal to collect the field captain must ensure no-one is still on the shooting line. The field captain has the authority to remind archers to vacate the shooting line unless they are shooting, or coaching another archer. They should also remind archers who are not shooting that they should be behind the waiting line. To avoid confusion there must only ever be one field captain at any one time, ideally the same person for the whole session. The field captain can transfer duties to another trained archer if they need to, but ideally this should be announced to ensure everyone knows who is now in charge of the field. Some results have been received for the November Frostbite and Portsmouth postal leagues. Good news for some…. Bad news for others,,,,, Nail-biting nervous wait for the rest as their results haven’t been released yet. Head to the >> POSTAL LEAGUE PAGE << to see all the latest. Well done to Sarah I’ for gaining her Junior Master Bowman Classification. The top award Junior archers can achieve. Here is a picture now that ArcheryGB has finally awarded her with her classification badge. and keep your arrows in your case or bag until you are on the field ! The November Winter Postal shoots of the season have been shot, and all the team information so far can be found ,unsurprisingly, on the >> POSTAL PAGE << for both the Frostbite league and the Portsmouth league. During the summer outdoor season 17 Castle Bowmen archers broke a total of 66 club records with their magnificent shooting. Achievement Certificates will be awarded in due course. REMEMBER THE CLOCKS GO BACK 1 HOUR SUNDAY 28th - so 9am in the morning will turn into 8am - ALTHOUGH IF YOU FORGET YOU WILL BE NICE AND EARLY TO SET UP THE FIELD . ArcheryGB have released the final 2018 UK rankings list, and Castle Bowmen feature. Well done to all Castle Bowmen archers who competed in the 7th Annual Team H2H shoot. Lots of good shooting, better than expected weather and plenty of cakes made the tournament lots of fun for all, Plus the unveiling of Castle Bowmen’s new flags. Kathy C’ & Sarah I’ now add their names to the growing list of Champions for this event. Steve C’, Drew M’ and Wendy W’ also picked up winners medals. The much coveted Wooden Spoon trophies (created by Stuart H’ especially for this competition) this year goes to Caz’ P’ & Gerhard N’. The final Welsh Rankings for 2018 have been announced and Castle Bowmen has performed more than admirably. 15 of Castle Bowmen’s best archers feature in this list of the best in the country. Click >> HERE << to find the full list of Castle Bowmen archers featuring in the Welsh Rankings over the years. OUTDOOR - Sunday Morning Shooting continues unchanged (9am to set up & approx’ 12-12.30pm to pack away). Congratulations to Sarah I’ and Karl C’ for becoming the latest Welsh Champions for 2018. Despite the wet and windy day Rick S’, Steve C’, Karl C’ and Sarah I’ made the trek to the 2018 Welsh open Championships. In their own words Rick and Steve “shot as expected”, but at the end of the day Karl had come top of the Gent Barebows to take Gold and the title, and Sarah triumphed once again to take the Welsh Junior Lady Barebow champion title for the 3rd year in a row, the Gold and most importantly shot awesomely to get the score needed to become the newest of Castle Bowmen’s Master Bowman. The WAA Inter-counties tournament is an annual event that pits the best archers from across all the Welsh counties against each other to find the greatest in the land. Glamorgan Archery Association put out a call for all the finest archers across the county to gather at this event to uphold the honour of this small part of Wales. At first the outlook was bleak…. things were looking bad…. what could be done ? Then… out of the rain and mist, and drizzle, and cold, and damp… came Castle Bowmen ….. striding in slow motion across the fields like the goddamn heroes they are to save the day (well a little bit of the day, not the whole day). Caz’ P, Kathy C’, Chris O’ & Andrew P’ (Barebow Team), Alan G’ & Wendy W’ (Longbow Team), Mike Wo’ & Michelle W’ (Recurve Team) and Sarah I’ (Junior Barebow Team) truly battled with the elements, fighting extreme cold, driving rain, unforgiving wind and quite a lot of mud they shot the best they could in the conditions. In the end the battle for county supremacy was lost by a single point to Gwent, bringing the total wins between them and Glamorgan over the years to a tie. But the mighty Castle Bowmen Barebows (pictured above) were victorious in winning their category by a significant margin. Thus proving the ancient saying correct - that fortitude, teamwork, diligent practice, extreme dedication and plenty of bacon and eggs for breakfast doth a champion make. The 2018 world famous Cambria Bowmen BBQ shoot was as magnificent as always, and this year it was in the pouring rain. This didn’t stop the intrepid Castle Bowmen heroes from competing in the drizzle, shooting awesomely, and taking home plenty of shiny bling. 10 Castle Bowmen entered : 10 medals, 4 county records, 4 Welsh records, 1 unofficial UK record and 2 raffle prizes were taken away at the end of the day. Sarah I’, beating the gent recurves in her round, took Gold on the Windsor round for Lady Barebows along with County and Welsh records. Michelle W’, for the Lady Recurves on the Albion round, took home a Gold. Caz’ P’, also on the Albion round, took Gold plus County and Welsh records. Rick S’, for the Gent Recurves, took Silver on the Albion round. On the St George round Chris O’ took Gold for the Gent Barebows. Alan G’, for the Gent Longbows took Silver on the St George round. Wendy W’, on the St George Round, took Gold for the Lady Recurves, beating her own County and Welsh Records. Kathy C’, also on the St George round also took County and Welsh records and a Gold medal. Kathy also broke the UK record for a Lady Barebow shooting the round. and finally on the St George round for the Gent Recurves Mike Wo’ took Gold and a Trophy with Steve C’ taking the Bronze. Congratulations to Sarah I’ for once again taking Gold for the Lady Barebows at the West Midlands Archery Society Open Junior Championships, with another Master Bowman score as well. The Summer Longbow Postal Season is over for another year and we won't know the official results of how the teams have done for some time. So in the meantime here are the best 5 scores of the Season. At the Gwent Championships in Chepstow this year the weather was very warm but with very little wind, which was good news for Castle Bowmen's Rick S', Wendy W', Mike Wo' and Sarah I' who were competing. Sarah won the day by taking Gold as top Junior Lady Barebow Visitor for the Metric 1 round (with a magnificent Junior Master Bowmen score) and Mike Wo' took 3rd place for the Gent Recurve Visitors in the WA1440 round. Sarah, Rick, Wendy and Mike all shot seasons best scores for their respective rounds. Congratulations to our Junior Sarah I' for winning the Gold in her category at the Gloucestershire SENIOR County Championships. She was the only representative from Castle Bowmen and shot very well under some challenging windy conditions. The Archery related theme this year is Archery Gods & Goddesses, and it will be up to you to decide which ones we include in our pantheon. >> CLICK HERE << to go to the voting page to decide on your favourite. Check out the >> Postal Page << to find the Top Ten Hall of Fame scores for the Season so far. See if you have made the list or how close you are. Still a couple of months to get on the list. THE GLAMORGAN COUNTY CHAMPIONSHIPS !!! The Glamorgan County Outdoor Championships.... The pinnacle of County archery tournaments held Outdoors in Glamorgan this month... If any spectators had accidently found themselves viewing the proceedings they would indeed have said 'These are the finest archers in this field at this time'. Castle Bowmen sent many of it's best archers to compete in this prestigious event, and they all, without exception brought glory and honour to the club with some magnificent shooting. Rick S', Mike Wo', Karl C', Andrew P', Sarah R', Michelle W', Caz' P' and Chris O' battled against the blazing sun, tiring heat and queuing up at the bar afterwards, to bring back some shiny bling and excellent achievement's. On the Hereford round Caz' shot an awesome MB (Master Bowman score) to take the Gold for the Lady Barebows, which was also a County record. Michelle shot a PB (personal Best score) to take Gold for the Lady Recurves and Chris, also with a PB, claimed Gold for the Gent Recurves. On the York round Rick shot a Seasons Best, his best score for the round in 3 years, despite starting the 3rd distance a little early he then remembered his sight should have been set for 80yards not 60 ! Also on the York round Sarah shot very well during the day to claim a new Glamorgan County record and took home an awesome Gold for the Lady Barebows. For the Gent Barebows Andrew, also shooting a PB, ended the day with a shiny silver medal in 2nd place, just losing out to Karl, also with a Seasons Best, who took home the Gold. Mike, for the Gent Recurves, at the halfway point of the day was in silver medal position. And after clawing back points from the leader after every single dozen ended the day in .. still Silver position. But with only 12 points between 1st and 2nd it was a fun close battle. All in all the day was summed up quite succinctly by Karl - "it was ok"
It's that time of year again when thoughts turn to the end of summer shooting, the start of winter shooting and of course the old favourite ..renewing your archery affiliation. Details have been sent out in this month's Newsletter, so probably best to read it this month. Fee's MUST be paid for you to be eligible to continue shooting legally. The end of September is the absolute cut-off date but obviously ArcheryGB always takes time to process everything and issue new membership cards, so early payment is recommended. IF you are not sure whether this tournament is suitable for you just ask one of our award winning coaching team for advice. ''The day started with a let’s get that dustbin off the roof before starting off – after half an hour of travelling through driving rain – flying dustbins – cats – dogs and branches – I finally made it – To the Car. What a start !! Stopped off at the services for a health inducing Ginsters Pasty – stupid health conscious farm shop didn’t have any – and second soaking of the day was endured for zilch. Anyway by 9-15am 'ish Castle Bowmen’s two toughest archers Myself (shorts and t shirt) and Sarah I, were warming up (well standing cold, wet and shivering) ready to start – eating a bacon butty (well I was anyway). A few pleasantries with fellow archers – like [what] are we doing here? - and we were off. For me 100 yrds actually went ok after a 4 first end and a 9 last end but one. 80 yrds was ok as was 60, but not amazing. 636 scored about 60 up on Neath. 100 yrds over the left shoulder very strong gusty wind and steady rain – a good open stance and windage at max to the right and some arrows actually made the yellow bit – could have done with the danage boss for feedback- boing !!!!! – couldn’t hear a thing in terms of hits and scopes were blowing over when they were not full of water. 60yrds full face on gale force hurricane with driving rain. Sarah should use this as an excuse for the miss on last end that cost her a JMB score after sticking it out valiantly for an amazing score of 596 on the Hereford and Bling – Gold in her age group and would have got second as an adult losing only to a GMB score of 860 plus. Thankfully things eased just for enough time to take tents down and get to the car before it absolutely rained some more – was going to nip into the changing rooms for a clothes change – no point would have just got wet again – so after wriggling into a dry pair of swimming trunks I set off home ( just as well I travelled alone) in a very damp steamy car. Sorry to Sarah! !- who stayed on to collect her bling and cuddly tiger - I should have been more supportive. But I think if I had settled in a nice warm bar I would still be there now !!! Odd as it may seem – still enjoyable and a fun day out ! Many of the finest archers in the land... well in Castle Bowmen, travelled once again across the borders to shoot in the Supermarine Bowmen WRS Weekend Tournament. A two day shoot, with a Double WA 70m on the Saturday shot by Rick S', Steve C', Ryan P' and Caz' P', and a mighty difficult WA1440 round shot on the Sunday by Karl C' and Sarah I' shooting her Junior equivalent. "Well – Saturday morning started at around 4.47 am to be precise – a cool overcast start to the day (well it would be at that time of the morning). Hit the road around 6-15 (Steve was away earlier and Caz and Ryan a little later. We all got here in reasonable time ready for the 8-00 am kit inspection – do they not sleep in Wiltshire. Practice commenced at 8-45 sharp – still overcast – mild breeze and fairly cool. Todays the day for a break through !!!!!!!!!!!!!!!!!!!!!!!!!!!!!! And I was right there was a breakthrough - in the shape of a really hot sun burning a hole in the cloud right above our heads – I think Steve and I probably contributed to the localisation of the cloud burn – the sun came through hit our respective bonces and went straight back up to complete the burn through. Needless to say from then on it was hot hot hot – and very humid !! Cant really complain about the wind it was quite mild and most of the time predictable. Shoot was very well run as ever – with shed loads of cake and burgers etc available. I abstained of course in respect of my diet and new found fitness improvement but I think Ryan and Steve took advantage. Tight shoot between the three of us for a while – all shooting pretty well really. Tournament mentality and experienced prevailed and saw the wizened old [guy] top the dynamic trio with a 200 point improvement on his Cheltenham efforts. Both Steve and Ryan did seasons bests in tournies I believe and were happy with their day. Did I mention it was hot !!! First time ever I had to go back to the car for more Lynx !!! Made new friends and enjoyed reminiscing about Cheltenham with a few others that had suffered a couple of weeks ago….nice to know it wasn’t just me ! Sunday I gather was just as hot but it seems nothing gets in the way of Castle Bowmen’s Barebow team – with Sarah and Karl both shooting well and both taking home the GOLD bling. Roll on next Sunday for another adventure – and a 9-45 assembly – more civilized in Cheltenham. " Well done to all those that shot in this month's Postal League shoot, many PB's and H/C's were improved upon (as listed above in the Monthly Improver section). Congratulations to all that improved their Team positions from last month, and to those shooting in the league for the first time. Is there a Recurve now shooting as Barebow ? This was found at 60yards. Please claim at the Lost & Found office. But as you will see from Chris's report below they both did extremely well, both coming home with shiny medals. A magnificent Recurve Gold for Michelle and a well deserved Barebow Silver and a PB (Personal Best score) for Chris. All the JUNE postal results are in and can be viewed on the Postal Page. SPOILERS ! !… Some teams still have a 100% success rate this Season...some do not. RJD Archers Open UK record status Western tournament was the next destination for the Castle Bowmen archers. Steve C', Wendy W', Mike Wo' and Kathy C' all braved the unseasonably hot heat to bring back the Gold and the Glory...and they succeeded spectacularly. The day was incredibly hot but the fabulous archers still manged to get through the entire shoot, more or less, to grab the medals at the end. But It wasn't without the drama. During one end at 50y the ever observant judges blew the whistle even though Steve was still shooting. Steve informed them that he can't have ran out of time, and they agreed they had made a mistake and let him continue to shoot his last arrow, which was shot with such high concentration and precision it could only ever be heading into one colour...yes it hit the blue. At the end of the day all of Castle Bowmen had scored a SB (Seasons Best score), with Steve also shooting a Glamorgan County record and Wendy taking Gold for the Lady Longbows, Kathy got the top score for the Lady Barebows and Mike took Gold for the Gent Recurves. Rick S' and Karl C' travelled far away to represent Castle Bowmen at the Cheltenham Archers Annual 2 day Record Status Tournament. But being a kind and sharing sort of club they split it between them and while Rick shot the Double WA70m on the Saturday, Karl then shot the WA1440 round on the Sunday. They both enjoyed bright sunny skies the whole weekend, although the tricky wind conditions did cause a few hiccups.
" A lonesome archer went forth early Saturday morning, a far cry from last year when many Castle Bowmen travelled for the annual Catherine Oldacre Memorial Event. Despite a poor (almost non existent) nights sleep things looked hopeful as cloud appeared on the horizon around 7-00 am – will it be cooler than expected and windless. Well the answer was a resounding NO!!! It turned out very hot and very windy – the worst kind – head on gusty and slightly to one side. They could have put half faces up on the left side of the target and no one would have lost many points. You could see arrows flying from outside the RH side of the target and landing on the left – my arrars being lighter drifter more . At one point my windage adjustment was right over to the left – the sight pin unwound and I even started to unscrew the sight aperture to get windage. (till it dropped off). Needless to say scores were awful – 313 and 297. Had some good ends though and some nice groups at times – How can you do 9,9,8,8,m,m – 10,10,8,7,m,m. Hit on one cunning plan that got me a few golds – I reverse engineered the aim/release process. Wait for it to be still – get a steady aim on 2 o clock black then wait for the wind and release – first attempt X – worked a couple of times after that. Great day out as usual – but ended up with a touch too much sun. Still that’s my 5 rounds done for ranking although my HC will suffer badly – I shall return !!" "I could have done better but It was better than last time so it was alright"
Tip - The best way to get your arrow back quicker if you lose it - always have your initials on every arrow, as recommended by ArcheryGB. Juniors Please note that the NEXT Junior Saturday will be 14th July - This is a slight change to the pattern, but will then carry on every 2 weeks from then. First confirmed win for one of the JUNE postal teams >> SEE THE POSTAL PAGE << for all the information throughout the season. Well done to all the Castle Bowmen archers, especially those in their first competition, shooting at our Annual Mid Summer 'Doug Woodley' WA900 Tournament. Nearly 30 archers from around South Wales came to compete at this annual shoot, and also enjoyed shooting on one of the hottest days of the year. Castle Bowmen Juniors Sarah I' and Rachel T' both took Gold in their age categories for the Lady Barebows. The Senior Lady Barebows also did extremely well with Sarah R' taking Bronze, Caroline P' taking Silver and Kathy C' collecting the giant Gold medal. The Gent Barebows did very well too with Paul Y' winning Bronze, Chris O' in his first tournament taking Silver and Andrew P' winning a well deserved Gold. Wendy W', who also performed the duties of Lady Paramount, took Gold in the Lady Longbow category with a County record. For the Gent Longbows Stuart H' took home the Bronze and Alan G' takes the Silver medal. In the Gent Recurve category Rick S' fought well to take home an excellent Bronze. Also taking home a Gold medal and a County Record Michelle W' took the top prize for the Lady Recurves. The Castle Bowmen Heroes shot at the Annual Neath Archers rose record status York/Hereford Tournament with some excellent if soggy results. The weather for the tournament started with a rain shower, carried on with some heavy rain, briefly interrupted with some more continuous showers and finished with a spell of rain. But Sarah I', Michelle W', Caroline P', Rick S', Steve C', Mike Wo', Andrew P' & Karl C' battled through to the finish without a complaint... ok there may have been a few complaints … but they did all finish under extremely tricky conditions. In the end Every Castle Bowmen archer scored a Seasons Best Score with a couple of them also getting PB's (Personal Best scores). In the Hereford Round Caroline Collected the Gold for the Lady Barebows with Sarah also taking Gold for her age category and Michelle taking Silver for the Lady Recurves. In the York round for the Gent Barebows Karl took home a well deserved Gold and for the Gent Recurves Mike took the Bronze. Rick and Steve had a mini battle of their own, with each taking the lead as the distances got closer. It all came down to the final end at the final distance with Rick finally grasping the victory. Team A... 1st Place in the Division !!! - WINNERS !!! Team A...1st Place in the Division !!! - WINNERS !!! Excellent results for all those who contributed to Team A and good shooting from everyone else. 2nd place in nearly all the other divisions is a good result. ArcheryGB have released the first UK Rankings list for the 2018, and Castle Bowmen Recurves have a few entries. We'll see if these positions change by the end of the season. POSTAL LEAGUE's - From now on PRACTICE will start as soon as the field is set up safely (9.15am approx'). SO the earlier you arrive the more practice time you get. Everyone shooting the Postal Leagues will all start SCORING at 10am on the dot. No exceptions. You can still score if you arrive later but practice time FINISHES at 10am as the scoring will then commence. This is to keep the tournament running as smoothly as possible and still have a reasonable finishing time for people to get home for lunch. Also please check how many people are already shooting on a boss if you wish to join it (as mentioned in the Rules of Etiquette (section N). It's always best to join the one with the least amount of archers as it speeds the total shooting time up no end. At the World Record Status Double WA1440 Tournament at Pembrey Country Park, hosted by Cymric Archers, Mike Wo' battled against the unrelenting sun and heat, the invasion of little bugs all over the field and the total lack of ice creams to compete in a gruelling archery weekend. After more than 300 arrows over 2 days he managed a seasons best score and took home the Bronze medal for the glory of Castle Bowmen. All the MAY Postal League results are in and listed upon the Postal League page > HERE < . 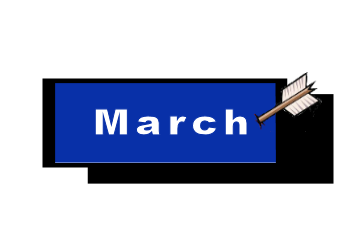 6 out of the 7 competing Castle Bowmen Teams WON their month's match. SO well done to almost everyone. Teams for JUNE, that have shot their rounds, are listed under JUNE. Competing teams wont have their team score listed until we receive the opponents score. Congratulations to Luke Y' and Heather B' for being presented with their Gold D.of.E Certificates at Buckingham Palace. These are presented to Young People who achieve the Gold Standard of The Duke of Edinburgh's Award. An excellent achievement for both. The first Postal League shoot of the season was shot under beautiful blue sunny warm skies, which may explain why nearly everyone had an excellent score by the end of the shoot. All the competing archers made it into teams, and first indications from the Postal League Guardian Katie suggest that we all did very well, with TWO teams already confirmed as taking a win from this first round of the season. To view our progress in the Postal League and to see which team you made it in to just visit the 'Postal Leagues' page from the main menu. Or >> CLICK HERE << to save scrolling back up to the top of the page. Confirmed results from each match will be posted there as we receive them. Well done to all our Awesome Junior archers who shot our Annual 'Val Goodman' Junior May Metrics tournament. The sun was shining for the whole day and there was none of that pesky wind to spoil the perfect shots. Some of the best Junior Archers from almost half a dozen clubs from over South Wales joined us to shoot this important event in the Archery calendar. The Castle Bowmen working party worked hard to ensure the whole day ran as smoothly as possible, with Val G' presiding over preceding's in her role as Lady Paramount. All of our Juniors did extremely well, with all of them winning their categories and taking home shiny Gold trophies. Very well done to Luke Y', Daniel H', Sarah I', Geoffrey C', Rachel T' and Candice L'. Extra congratulations to Candice for shooting well under pressure, with her opponent matching her arrow for arrow all day and ending with an unprecedented absolutely equal tie after all 144 arrows has been shot, something you rarely see. But it did mean they both went home with a Gold trophy. On the warmest, sunniest day of the year Castle Bowmen's elite team of archers were competing at the prestigious Welsh Archery Association Annual Head-to-Head tournament. Caz' P', Andrew P', Steve C', Rick S' and Mike Wo' all shot in the extremely hot conditions, and some of them had some very nice results at the end of the day. In the initial 70m Qualifying round Caz' and Andrew placed first and second in the joint Barebow category, Mike Wo' came 3rd for the Gent Recurves, and Rick & Steve enjoyed shooting too. In the important knock-out H2H round Steve came up against his old adversary Nigel, and despite having a good loose was beaten 6-0, but still enjoyed himself at the end of the day, especially after the final results revealed that he didn't come last. Rick's head-to-head went down to an exciting 1 arrow shoot off tie-break decider match, his opponent shot high into the blue.... unfortunately Rick shot a little higher, but it was a close run thing. Mike Wo' eventually was defeated by the overall winner in the Gent Recurves, he managed to keep within a few points of his opponent throughout his Quarter Final match, but was finally beaten. Well done to Karl C' for gaining his Bowman Classification, Only the 2nd Gent Barebow to attain this Classification since 2012. Castle Bowmen's AGM was well attended and lots of important club business was discussed. The new committee, charged with the smooth running of the club, were sworn in and a full review of the year was given by Rick S', the Chairman. Before during and after the official proceedings the members who attended enjoyed a lovely buffet arranged by Steve C'. This was also the official unveiling of the club's new look website (the one you're looking at now). Rick also wished everyone good shooting in the year to come. Castle Bowmen's Annual Easter Sunday Double WA70m Tournament was enjoyed by all the competitors who braved the dry, slightly muddy and rather cold conditions. Excellent shooting, exciting Head-to-Head style tie breaks to decide who got the chocolate spot prize and lots of fun chocolatey prizes throughout the shoot contributed to a good day for all. The Castle Bowmen working party were as awesome as always, setting up and packing away the tournament field with great efficiency. At the end of the day many of our archers took away many of the prizes. Our Lady Paramount for the day Caroline P' also took away the top prize for the Lady Barebows, with Kathy C' taking the 2nd place prize egg. Karl C' for the Gent Barebows also ended top with Andrew P' taking the Silver. Sarah I' and Rachel T' both took the top easter egg prize in their Barebow age categories. Michelle W' came 1st in the Lady Recurve category with Wendy W' coming 2nd, and in the Gent Recurves Mike Wo' also took 2nd prize. For the Gent Longbows Alan G' took home the silver position prize too. The indoor shooting winter season has now effectively ended. So now we look forward to Outdoor shooting at the field. The first Weekday session will be on Wednesday 4th April, with sessions also on Friday Evenings and the usual Sunday Morning. These will carry on until the end of September. Portsmouth League Team A is currently #1 in their division. Mike Wo' has been the highest scoring Gent for November, December and January in the whole division. Portsmouth League Team B is also currently #1 in their division. Kathy C' has been the highest scoring Lady for November and January in the whole division. Frostbite League Team A, Team C & Junior Team are all currently 2nd in the division with Team B and Team D are both 3rd in their divisions. For Team A - Mike Wo' was the highest scoring Gent for November and January. For Team C - Caz' P' was the highest scoring Lady for November & January with RIck S' the highest scoring Gent for November and Alan G' the highest Gent for January. In one of the final tournaments of this Indoor Season Kathy C’ and Andrew P’ travelled to a little competition in the far West of Cardiff to see if they could bring home the Gold and the Glory for Castle Bowmen. A fun but challenging day was ahead of them, full of interesting opponents, sheep, questionable toilets, bacon rolls and talk of dragons. At the end of the day they both , of course , prevailed to take away the treasures. Kathy took Gold for the Lady Barebows and almost claims her Red Dragon achievement Badge (1 point off). Andrew claims his Red Dragon badge, takes the Gold for the Gent Barebows and shoots a magnificent PB (Personal Best score). So congratulations all round for some awesome shooting. Castle Bowmen (Club of Champions) once again hosted the Glamorgan County Indoor Championships for the 12th consecutive year, and as always the whole day was a great success. It was enjoyed by Archers, spectators and judges alike, earning the club much praise. “ Thoroughly enjoyed the shoot “ Matthew - Pentref Bowmen . The super efficient Castle Bowmen working party helped ensure the whole event ran as smoothly as possible, and the Awesome Castle Bowmen archers ensured we picked up a few medals at the same time. Caroline P’, Kathy C’, Michelle W’, Sarah I’, Mike Wo’, Mike Bar’, Andrew P’, Rick S’, Dave M’ and Alan G’ all did an excellent job of helping to run the shoot and also Shoot the shoot too. With Steve C’ and his excellent catering team providing refreshments to all the hungry competitors. At the end of the long competitive day both Castle Bowmen’s Barebow team (Caroline, Kathy & Andrew) and Recurve team (Michelle, Mike & Mike) did very well to both come in 2nd place. Michelle W’ came in 2nd place for the Lady Recurves and took away a Silver medal. Kathy C’, for the Lady Barebows, (also performing the Lady Paramount duties for the tournament) took home the Bronze medal after finishing in 3rd place. But the biggest congratulations of the day must go to Caroline P’ for coming in 1st place to win the Gold and Trophy to become Castle Bowmen’s latest County Champion. In the greatest traditions of the greatest explorers Castle Bowmen had a busy weekend, travelling to the East like Marco Polo along the silk road and West like Christopher Columbus to the New World. All in search of Gold, treasures, meeting new people and bringing back great riches and glory. And much like the explorers of old they came back with tales of great victories, arduous struggles and interesting exotic smelling foreign goods. Rick S’, Kathy C’ and Andrew P’ indeed travelled East along the trade route known as M4 and competed in the mighty Llantarnam Double Portsmouth Tournament against the most fearsome of foes. The day was long but some success was gained by our awesome archers; they won some excellent raffle prizes in the form of fluffy slippers and a candle which has a delicate aroma that has been described as “not nice”. The day was won however by Kathy for the Lady Barebows who won the highest prize of a Gold medal, and overall everyone enjoyed the day. To the West Mike Wo’ was forging new ground and meeting new peoples by competing in RJD Archers very first indoor tournament, a UK record Status WA18m round. In a slightly competitive competition against adversaries familiar and unknown Mike prevailed and ended the day victoriously taking away the Gold prize, as well as some nice Welsh Cakes. After the first round in both the Postal Leagues (Frostbite & Portsmouth) we had four of our teams in first place positions in their respective divisions. For the Junior Team Sarah I’ was the highest scoring Lady in their Whole Division for November. & Kathy C’ was the highest scoring Lady in the whole of Team B’s division. Castle Bowmen archers started the year in good form at the Welsh Indoor Championships held at the Welsh Institute of Sport in Cardiff. Kathy C’, Sarah I’, Andew P’ and Mike Wo’ were all in attendance for one of the most prestigious shoots on the Indoor season calendar. All shot very well (obviously) at this highly competitive tournament with Andrew scoring a PB (Personal Best score) and Kathy taking home the Bronze medal for the Lady Barebows. Kathy was also presented with her medal from the Welsh Archery Association Chairman for finishing top of her category in the Welsh Rankings last year.